If you’re experiencing pain from uterine fibroids, you may have heard that surgery is your only option for relief. However, the risks of uterine fibroid surgery often outweigh its benefits. Over 20 percent of women believe that surgery is the only available course of action for treating fibroid symptoms, even though there have been non-surgical procedures available for years. If you’re weighing your alternatives and wondering if uterine fibroid surgery is dangerous, read on to learn more. 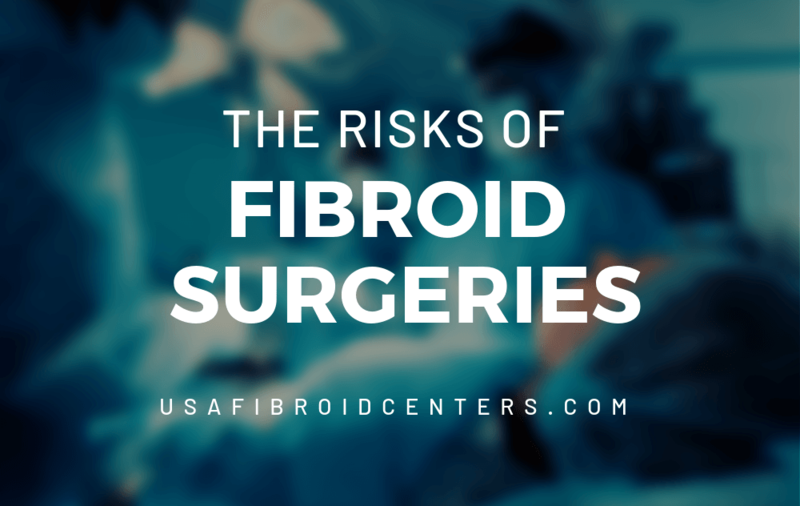 We’ll explain the risks involved in undergoing invasive surgeries — and how USA Fibroid Centers offers a better option. The dangers of uterine fibroid surgery include the following. Research shows that a hysterectomy can increase your overall risk of cardiovascular diseases and particular metabolic conditions. Women under 50 years old are especially more likely to be later diagnosed with heart disease after undergoing fibroid surgery. One procedure — known as laparoscopic power morcellation — has been linked to the spread of uterine cancer. During this procedure, surgeons use a medical device to break the fibroids into pieces to make removal through the abdomen easier. However, if the woman also has uterine cancer, the procedure can spread the cancer to the abdomen and pelvis, making it more difficult to treat later. After undergoing a hysterectomy, women may remain the hospital between two to three days following surgery. Once at home, the recovery time for a hysterectomy is typically between six to eight weeks. During this time, you may have trouble going back to work and performing routine tasks. Many doctors recommend women to avoid lifting for four to six weeks following a hysterectomy or myomectomy. The extended post-surgical pain can also take a toll on your body and mental health. Due to the fact that hysterectomy either partially or fully removes the uterus, patients will not be able to bear children in the future. While a myomectomy leaves the womb intact, the procedure can also cause uterine problems like uterine infections and scarring, that might affect future pregnancies and overall fertility. While a hysterectomy completely removes the risk of fibroid regrowth, women who undergo other surgical options might again suffer from fibroid symptoms in the future. Studies show that up to one-third of women who have a myomectomy will need future surgery due to new fibroid growth. Should I Get Surgery to Treat Fibroids? Ultimately, the choice to get fibroids surgery is yours; however, there are many women looking for a safer, more convenient alternative. Many of our patients have told us that they avoided fibroid treatment because they did not want to have a hysterectomy. A fibroid specialist, like the ones at our fibroid centers, will take their time developing a personalized treatment plan that fits your individual needs. USA Fibroid Centers specialize in a non-surgical, outpatient treatment called Uterine Fibroid Embolization (UFE). Research has proven this treatment to have a lot less risk compared to a hysterectomy. We’ll be happy to help you learn more and decide if UFE is an ideal treatment option for you. UFE is a non-surgical, outpatient procedure that shrinks fibroids by cutting off their blood flow via a small catheter threaded into an artery. As the fibroid shrinks and dies, symptoms should begin to decrease; thus relieving your discomfort and helping you enjoy a healthier life. If you’d like to learn more about the specifics of a UFE procedure, feel free to explore our website or give us a call (855) 615-2555 anytime. Find freedom from fibroid pain without the risks of invasive surgeries. Contact us today for more information about our services, or schedule an appointment at your nearest location to find out if UFE is right for you.